The political atmosphere in 1968 is one of extended scholarly inquiry, Leftist reminiscence, and subtle—if not blatant—similarity to our present world, exactly fifty years later. Chicago was a hub of political organizing up until this point, both of national and community-oriented grassroots campaigns. However, by the end of 1968— with the murder of Malcom X by the Chicago Police Department, the protests and anti-police riots of the 68’ Democratic National Convention, and the overarching repression of the Daley administration on Chicago activists—the feeling was gloom, perhaps a realization that the good would not always prevail. The artists created works for mass-production—primarily posters and other printed ephemera—though they also exhibited nationally. The artists, though before their collation’s founding, were heavily involved with the creation of the Wall of Respect, a seminal mural celebrating Black liberation, located in the Bronzeville neighborhood of Chicago from 1967–71. In their influential reach, AfriCOBRA revolutionized Black aesthetics of the time, paving the Black Arts Movement in Chicago (which was adn still is heavily associated with Harlem). The group met often to discuss contemporary aesthetics and presented their first two group exhibitions with the Studio Museum Harlem (AfriCOBRA I: Ten in Search of a Nation in 1970, and AfriCOBRA II in 1971). 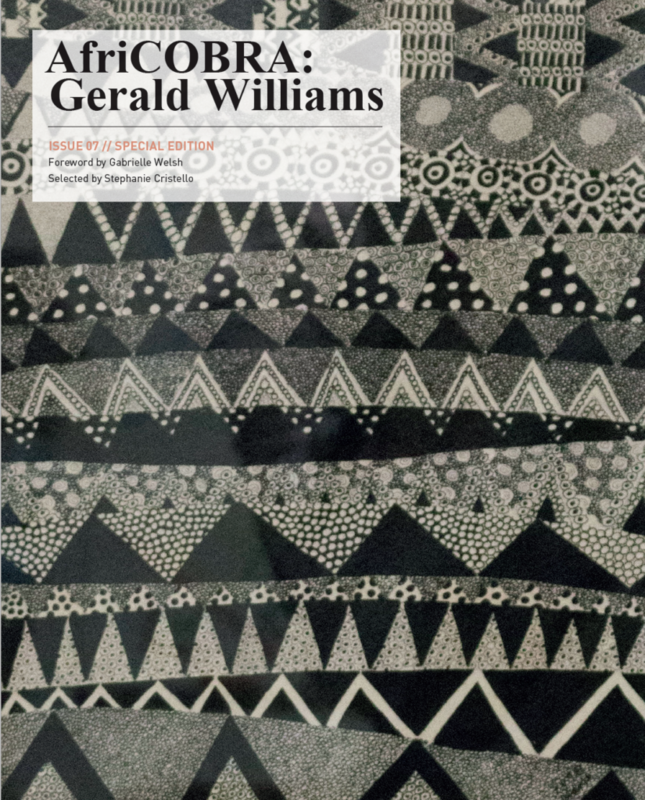 Selected especially for THE SEEN Issue 07, this presentation of pointilist works by Williams from 1970–2013, depict a rare pairing of the full-color compositions adjacent to the black and white designs, spanning over forty years of the artist’s career. As such, this edition unfolds as a photographic essay on what Williams terms “mimesis at mid-point,” conveying a vision of harmonies that are simultaneously informed by contemporary urban symbology, Indigenous traditions, personal narrative, and a global perspective. Williams’ work is polyrhythmic, layered, and multi-faceted; flowing between expressive, gestural freedom and meticulous control. To view the specially chosen images, please read in the PDF format. Williams is included in various concurrent exhibitions, including The Time is Now! Art Worlds of Chicago’s South Side, 1960–1980 at the Smart Museum of Art through December 30, 2018, The Art and Influence of Dr. Margaret Burroughs at the DuSable Museum of African American History through March 4, 2019, and an exhibition curated by the artist on the occasion of the fifty-year anniversary of the group, AfriCOBRA 50, is on view at Kavi Gupta Gallery in Chicago through November 24, 2018. 1 Donaldson, Jeff. “Ten in Search of a Nation.” Black World, October 1970, 80-86. 2 Barcio, Phillip. “For Gerald Williams, a Co-Founder of AfriCOBRA, Transnational Black Aesthetics Are as Relevant as Ever.” Hyperallergic. November 10, 2017. Accessed September 06, 2018. September 26, 2018 | Filed under Art Seen: Chicago and tagged with AfriCOBRA, Dusable Museum of African American History, Gerald Williams, Kavi Gupta Gallery, Smart Museum of Art.